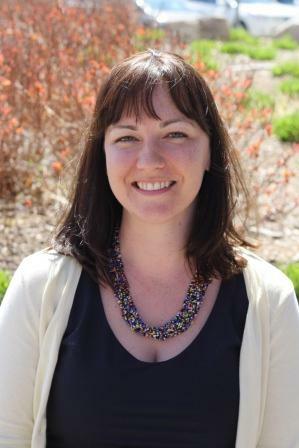 The annual So You Think You Can Write program is a great way to get your manuscript in front of a team of editors, but we also accept submissions all year long. Here at Harlequin and Carina, we’re always looking for new authors to sign, publish and build. But we recognize that putting your manuscript out on submission can be an intimidating process. How do you make your manuscript stand out, from the query letter to the last page? What do you do when you’re ready to submit? I’m here to demystify the submissions process by giving you some insight into what an editor looks for when she opens up a submission for review. Sending your manuscript out on submission is a big deal. You’re putting yourself out there, asking us to fall in love with your manuscript and make you an offer. We want that too! We are looking for books to acquire, not books to reject. And we ask you for three things when you submit to us: your synopsis, your manuscript, and your query letter (sometimes called a cover letter). A good query letter can be an extremely effective way to rocket your book to the top of our TBR pile. We want to learn about both, but it’s vitally important that your book come first. Think of a query like the marketing blurb you see on a retailer site; if you were selling your book to a reader, what would make them pick it up? The first paragraph(s) of your query letter should convey tone and character, and hook us on the key story elements so that we want to dive in right away. 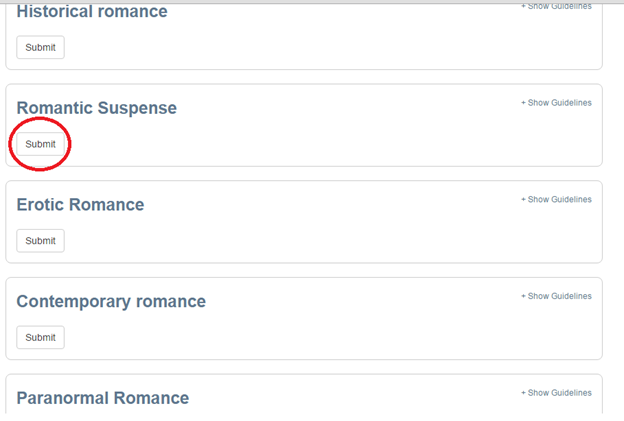 And don’t forget to include the basics: word count, genre, and whether there are any future books planned in the series. These details are vital information for your potential editor to have. After you’ve hooked us on the story, it’s time to tell us a little more about yourself. What kind of information should you include? While basic bio information can be helpful, at this stage we’re more interested in knowing what kind of support plans you have for spreading the word about your writing. Are you on Facebook or Twitter? Do you have a website set up? Our digital commerce and marketing teams work closely with our authors to promote their books across your platforms as well as ours (and those of third-party retailers), and having an online presence is the first step to building marketing momentum for your book. 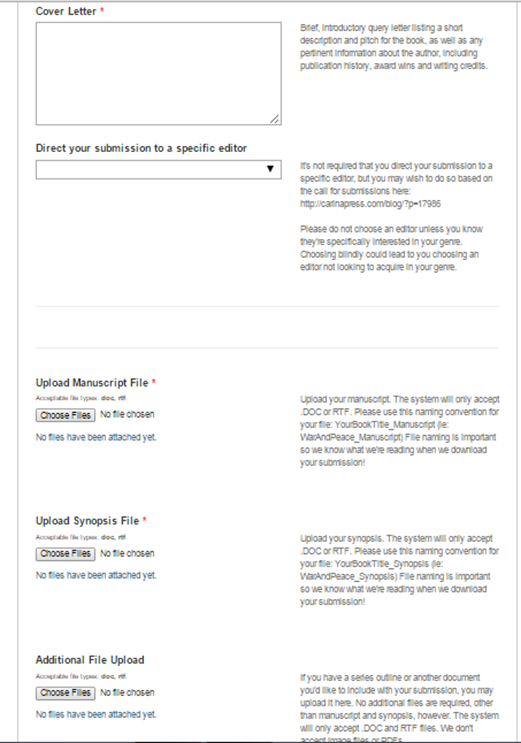 Additionally, we give authors the option to submit to a specific editor when sending in manuscripts. Although this is an option, not a requirement, I would recommend taking advantage of it. Research us online, find out who loves what type of story, and target your submission if you think it’s perfect for one of our editors. Start with story–personal details can come later! Writing query letters can be stressful, but we really do appreciate all the effort you put in. And remember, in the end, your book is the most important thing. We look forward to reading it! So you’ve written your synopsis and query letter to go along with your polished manuscript. What’s next? Keep reading to find some helpful Submittable tips for Carina Press submissions as well as Harlequin category romance submissions. From there, you’ll be asked to copy and paste in your cover (query) letter, and upload your manuscript and synopsis. 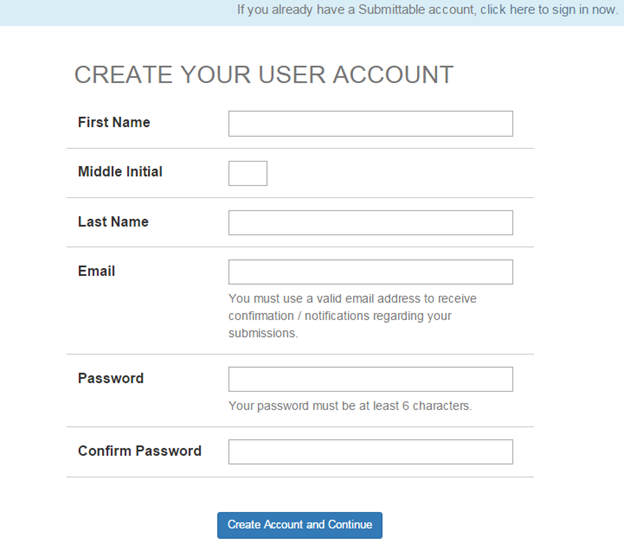 Below the series guidelines, you’ll be able to register for a Submittable account or sign in to your account. 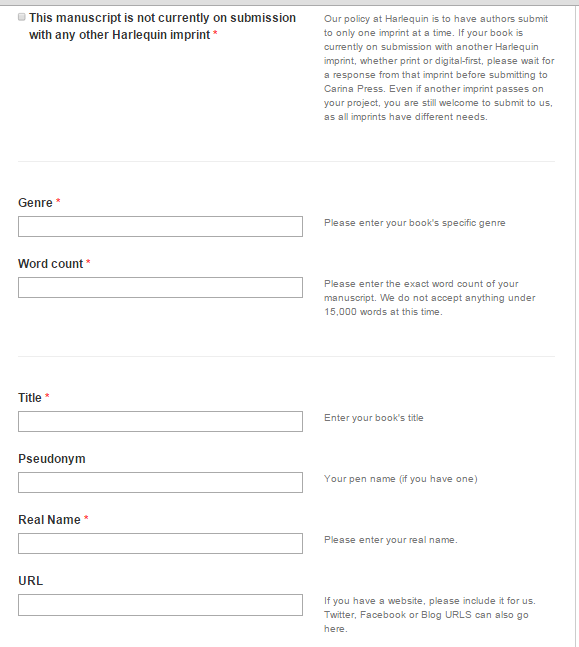 With a Submittable account, you can submit manuscripts, keep track of your submissions and get in touch with editors. 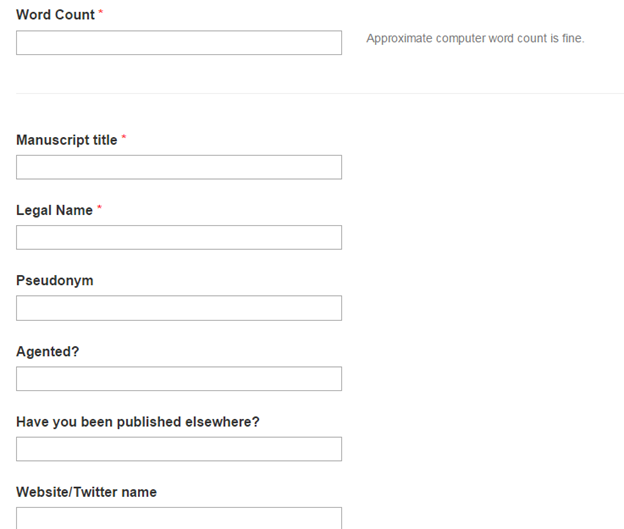 You’ll be asked to fill in information including word count, name, and manuscript title. 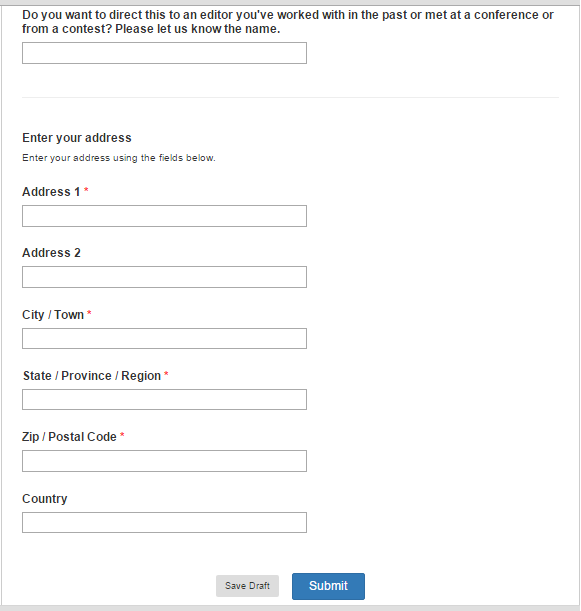 Next you’ll see a box where you can copy and paste your cover (or query) letter. 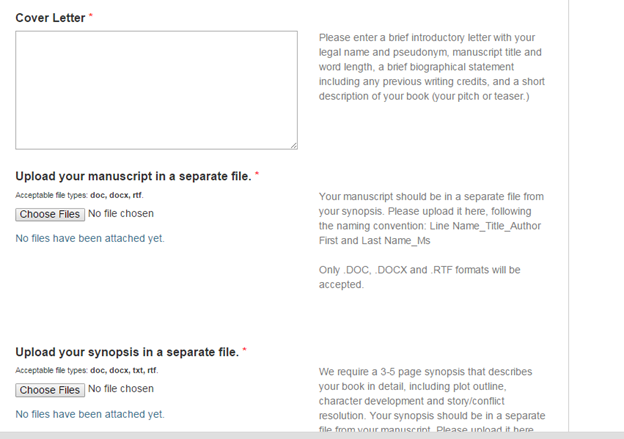 You’ll also be asked to upload your synopsis and your full manuscript as two separate documents. 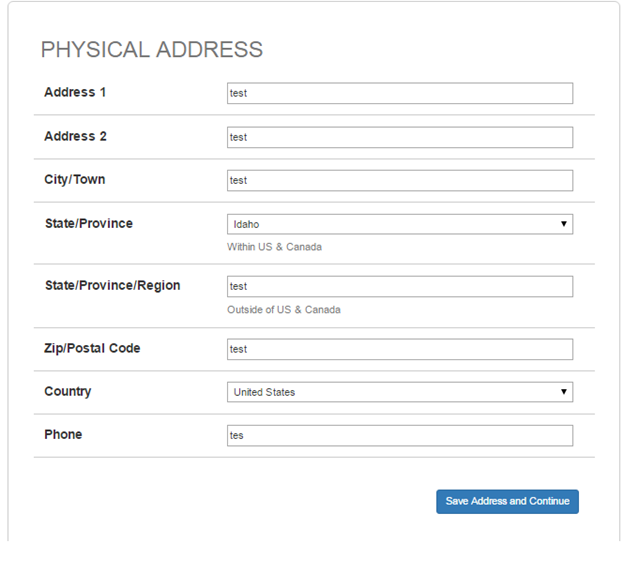 Finally, you’ll be asked to fill in some contact information, and that’s it! Submittable keeps track of your manuscript in our database, lets multiple editors access and evaluate it, and allows us to get directly in touch with you! Don’t forget that submissions are open all year round. We want to read your stories! Is there going to be a So You Think You Can Write Contest this year or is it going to be a series of blitzes? Hi, I’m attending the ACFW Conference in two weeks and I’ll be pitching my manuscript. What are the guidelines for pitching to a Harliquine editor? Your help would be greatly appreciated. I submitted a piece in May. 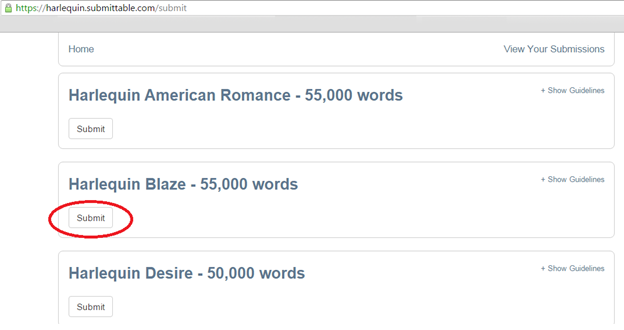 It still shows in process on Submittable. I have heard nothing. Is there any way I can find out what is going on? It is called Full Bloom. I just received an email from your editorial team regarding my manuscript. Is there a possibility to get more (personal) feedback on my manuscript? Hi! It sounds to be quite interesting! Thanks for your summary! I am glad to know that submissions are open all year round, so you will be able to follow http://bestresumewriting.services/ and read some stories there! I have written a good story, editted the manuscript into an after-life, and conducted multi-level beta reads. What I don’t know is how to get Harlequin’s attention via cover letter. Can you help? Is the submission process different if I have an agent? how long is a manuscript supposed to be? Am I to submit the entire story or the first three chapters/ 5,000 words?